CENTRAL PARK GARDENS TENANTS' ASSOCIATION: Pot Luck a Big Success! Pot Luck a Big Success! Over 90 people ate, sang, schmoozed, and had a good time at our annual Pot Luck Party. We listened to candidate Brian Benjamin (nominated by the Democratic Party to replace Bill Perkins who left the State Senate to become a City Council member) and to our own City Council Member Mark Levine. Then we ate some more! The primary credit goes to our Pot Luck Planners; Maxine Soares, Lydia Pitsirilos, Joan Browne, and Debbie Gonzalez. 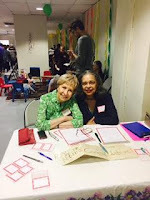 Lydia Pitsirilos, Maxine Soares, Debbie Gonzalez, Letty Orellano, Claude Saucier, and Vernon Smith, did the set-up and decorations, with a lovely motif of hanging spirals of paper (shiny and not). Joan Browne,Helen Merber, and Maria Acevedo greeted guests all evening and wrote down the dish those who signed in brought. The dishes were put out by Tish Howard with help from Melanie Eversley. Chariss Boisseau & Carlos: Mac& cheese, seltzer, and music! Special thanks to Chariss Boisseau for providing the music, to building staff Mike Medina, Lenny Moreno, and Modesto ("Ito") Santiago for their pre-party clean-up and to Barbara Geller for arranging the flowers outside. Thanks to Vernon Smith who found, cleaned, and prepared the table and chairs outside and to Claude Saucier and Vernon Smith prepared the children's rug and chairs. Tonight's the night for our Pot Luck Party!